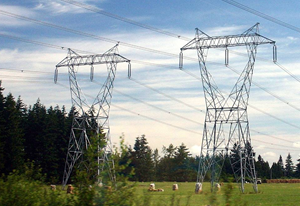 High voltage transmission lines are those on pylons that traverse the country side. The degree to which they emit an electric and magnetic field will depend upon the voltage and the current. There are two issues of concern here: in 1979, Wertheimer and Leeper reported that magnetic fields above 4mG (0.4µT) from high voltage transmission lines were associated with a doubling in the incidence of childhood leukaemia (Powerwatch, 2010). Secondly, the electric fields around the cables attract air pollutants from nearby traffic or from local industry. These charged particles are more likely to ‘stick’ in your lungs which may increase the incidence of asthma and other lung disorders in people living near them. Consequently government agencies around the world including the US National Institute on Environmental Health Sciences and the UK National Radiological Protection Board Advisory Group on Non-Ionising Radiation (AGNIR) now agree that magnetic fields are a possible carcinogen. This was confirmed in 2002, when the International Agency for Research on Cancer (IARC) classified 50Hz magnetic fields as a possible carcinogen (International Agency for Research on Cancer, 2002). Children exposed to magnetic fields of 4mG or greater, are twice as likely to develop childhood leukaemia (Wertheimer and Leeper, 1979). Testing for electric and magnetic fields from high voltage transmission and powerlines requires a volt stick and a 3-axis gauss meter respectively. You can do this yourself by purchasing the equipment from our shop. Be mindful however, this equipment will NOT be able to test for radio/microwave frequencies from cordless phones, mobile phones, mobile phone towers or any other form of wireless technology. To get all of the frequencies tested, consider getting a building biologist. For details, click here. Distance, distance, distance! As you double the distance away from the lines, you will effectively reduce your exposure by 75%. Homes should be at least 200 metres away from high voltage transmission lines however this may not address the pollution issue. Underground cables are a better alternative as the electric fields are screened by the earth, however the magnetic field will still be present.